Oh! I just love that lavender sash. What incredible color. I recognized Sargent's work before I scrolled down to the caption. Everything in the painting is masterful, but the fabric is just sublime. Look at the upholstery on the chair and backdrop curtain with the Asian characters. 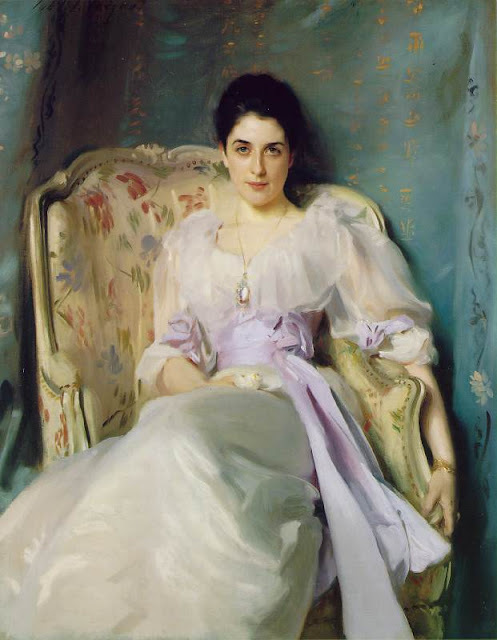 I adore Sargent. Honestly -- seeing his work in person just makes me speechless and a little breathless. Gorgeous offering! This picture was used on the cover of an edition of Edith Wharton's "The Age of Innocence". I recognised it after I saw it on your blog!